The unusual addition of Cauliflower adds a slightly sweet and charred roasted flavor to this dish. 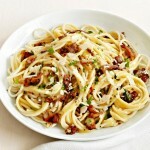 One wouldn't think Carbonara could get any better. Preheat the oven to . Place the chopped cauliflower on a baking sheet. Heat the skillet with the bacon fat over low heat. Add the garlic cloves and stir, cooking for a minute or so. Add the bucatini to the skillet and toss it well in the bacon fat. Remove the skillet from the heat. Pour in the egg/parmesan mixture and stir quickly and constantly to create a creamy sauce, tossing for 3 to 4 minutes or so. Toss in the cooked bacon and cauliflower. Top with the parsley and extra cheese. Taste and season additionally if you'd like. Serve immediately! 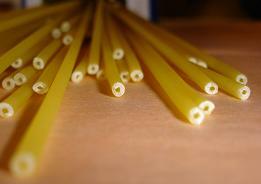 Bucatini, also known as perciatelli, is a thick spaghetti-like pasta with a hole running through the center. The name comes from Italian: buco, meaning "hole", while bucato means "pierced. 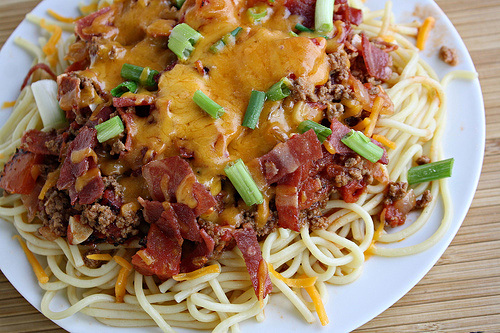 You can substitute spaghetti if you like. Bring a large pot of salted water to a boil. 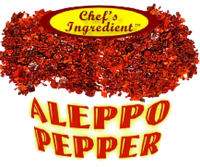 Combine the bacon, olive oil, garlic, rosemary, jalapenos and ¼ cup water in a large skillet. Cook over medium-high heat, stirring occasionally, until the water evaporates and the bacon crisps, about 12 minutes. Discard the garlic. Add the cognac, if desired, and cook until it evaporates. 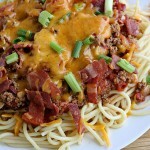 Remove from the heat and set aside ¼ cup bacon mixture for garnish. Meanwhile, cook the spaghetti in the boiling water as the label directs. Mix the eggs, cheeses, parsley and 1 teaspoon pepper in a bowl. 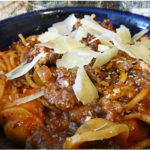 Drain the pasta, reserving ¼ cup cooking water. Return the skillet to medium-high heat. Add the pasta and toss until heated through, 1 to 2 minutes. Remove from the heat. 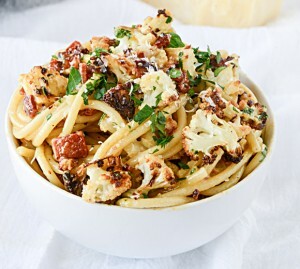 Whisk the reserved pasta water into the egg mixture, then quickly pour over the pasta and toss to gently cook the eggs and make a creamy sauce. 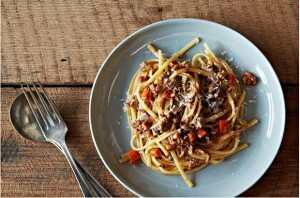 Garnish with the reserved bacon mixture and more Parmesan. 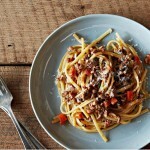 A comforting bowl of spaghetti bolognese is often what's needed on a chilly Winter day (or any day, really). Melt the butter in a large, heavy-based pot -- then stir in the pancetta and let it cook for five minutes or so, without coloring much. Meanwhile peel and finely chop the onion and garlic and stir them into the pancetta. Peel and finely chop the carrot and celery and stir them in, too. Lastly, finely chop the mushrooms and add to the pan, then tuck in the bay leaves and leave to cook for ten minutes over a moderate heat, stirring frequently. Now leave to cook without stirring for a good three or four minutes, then, as the meat on the bottom is starting to brown, stir again, breaking up the meat where necessary, and leave to color. Mix in the tomatoes, red wine, stock, a grating of nutmeg and some salt and black pepper, letting it come to the boil. Turn the heat down so that everything barely bubbles. There should be movement, but one that is gentle, not quite a simmer. Partially cover the pan with a lid and leave the putter away for an hour to an hour and a half, stirring from time to time and checking the liquid levels. You don't want it to be dry. Pour in the half-and-half or cream a bit at a time, stir and continue cooking for twenty minutes. 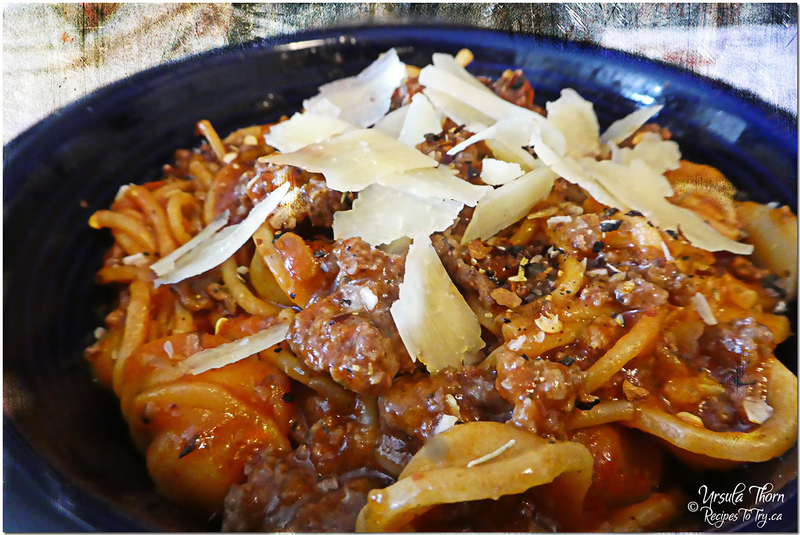 Check the seasoning, then serve with the pasta and grated Parmesan. Passata refers to an uncooked tomato puree that has been strained of seeds and skins. How is passata different from tomato sauce or tomato paste? Well, both the sauce and paste are cooked tomato products to begin with. 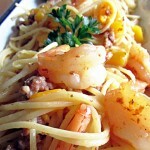 Tomato sauce often has other ingredients such as carrots, onions, garlic, etc. And tomato paste is cooked down and much thicker. You would not want to substitute either product if passata is called for in your recipe. If you cannot find it in your store, take plain canned tomatoes and run them through a sieve or a food mill. Tomato passata can be used in any recipe that calls for tomatoes where it is not important that there be pieces of tomato. In general, passata is considered to be a superior product to canned tomatoes, using higher quality tomatoes and processing. Heat a deep skillet over medium-high heat. Add extra-virgin olive oil and bacon. Brown and crisp bacon, 5 minutes, remove with a slotted spoon. Drain off a little excess fat if necessary. Leave just enough to coat the bottom of the skillet. Add beef and crumble it as it browns, 3 to 4 minutes. Add onions, garlic and stir into meat. Season the meat with salt and pepper, hot sauce and Worcestershire. Add ½ cup beer and deglaze the pan. Cook 5 to 6 minutes more then stir in tomatoes and tomato sauce. 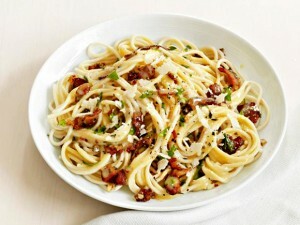 Traditional spaghetti carbonara has 610 calories, 28 grams of fat, and 15 grams of saturated fat per main-course serving. 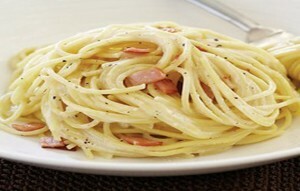 Our Low-Fat Spaghetti Carbonara has 400 calories, 10 grams of fat, and 3 grams of saturated fat per main-course serving. • 1. Bring 4 quarts water to boil in large pot. Process egg, egg white, cheese, evaporated milk, and 11/2 tablespoons mayonnaise in food processor until smooth; leave mixture in food processor. • 2. Cook both bacons in large nonstick skillet over medium heat until fat has rendered and bacon is browned, about 7 minutes. Using slotted spoon, transfer bacon to bowl; set aside. • 3. Add garlic and pepper to fat in pan and cook until fragrant, about 30 seconds. Stir in wine and simmer until slightly thickened, about 1 minute. Remove pan from heat, cover, and keep warm. • 4. Meanwhile, add 1 tablespoon salt and pasta to boiling water and cook until al dente. Reserve 1 cup pasta cooking water, drain pasta, and return to pot. 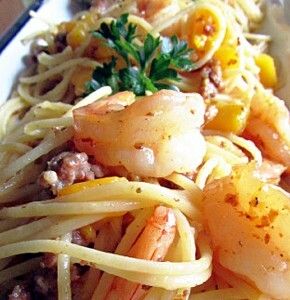 Toss pasta with remaining ½ tablespoon mayonnaise until coated. • 5. With motor running, slowly add wine mixture and ¼ cup hot pasta cooking water to egg mixture and process until smooth and frothy, about 1 minute. Immediately pour egg mixture over hot pasta and toss to combine, adding reserved cooking water as necessary to adjust consistency. Stir in crisp bacon and season with salt. Serve. 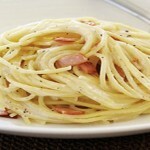 Any long, thin pasta such as linguine or fettuccine will also work here. 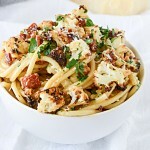 An equal amount of Parmesan cheese may be substituted for the Pecorino, although the cheese flavor will be less pronounced.